During the past few decades, there has been an increased concern over the presence of radon in the home. Unlike most threats, the only way to detect radon gas is through testing. It is considered highly dangerous by the Environmental Protection Agency (EPA) and may be either inhaled or (in some cases) ingested. But how do you test for radon, what are the risks involved, and can you eliminate it from your home? 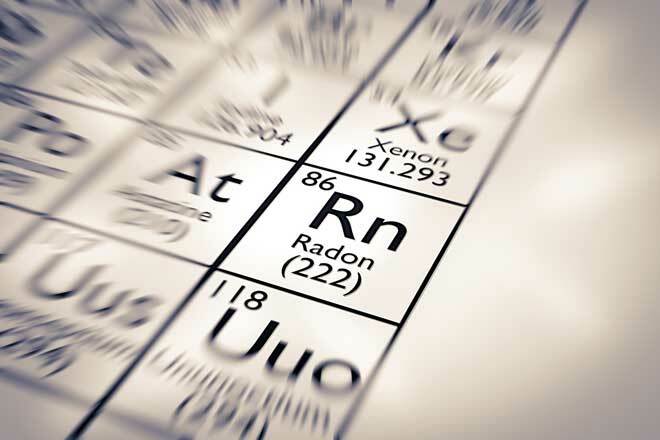 Radon is an odorless, colorless gas which is nine times heavier than air. Produced by the natural decay of uranium found in trace amounts within soil and rocks, it highly radioactive, producing the same deadly alpha radiation as plutonium. This dangerous gas may be found in homes, businesses, and schools around the world. It should be noted that one in every 15 homes has elevated radon levels, making this a common risk. Radon is the second leading cause of lung cancer deaths in non-smokers. Approximately 21,000 lung cancer deaths per year may be attributed to radon, of which 2,900 are non-smokers. Compare this to second-hand smoke, the third leading cause of lung cancer in general, which kills approximately 3,000 non-smokers per year. The risks are higher for children, as they have a higher respiratory rate than adults. How Does Radon Get in My Home? Radon has also been known to contaminate groundwater, and in some circumstances, enter the home through water supplies such as wells. Finally, in very rare circumstances, the building materials themselves can give off elevated levels of radon. When preparing to purchase or rent a home, you can request information on radon levels, just as you would termite testing or other concerns. In the event you plan to sell or lease your home, it is thus advisable to test ahead of time and have a copy of the results available. While you can’t detect the presence of radon through sight, smell, or taste; a simple test kit or hiring a professional can reveal a problem quickly. These tests determine the quantity of radon in the air by measuring via one of two systems. pCi/L, or picoCuries per liter, is most common in the US, while the metric measurement is in Bequerels per cubic meter (Bq/m^3). One Bq/m^3 is equal to 1/37 of a pCi/L. When testing, be sure to note which form of measurement is being used. Due to radon being heavier than air, the lower floors of your home generally have higher concentrations than the upper floors. Radon also tends to appear in higher levels during the winter when windows are shut, reducing the amount of ventilation. Additionally, as hot air rises and escapes through your roof, the cooler air is pulled upwards, which can bring additional radon from beneath your basement. Any testing device which remains in your home for more than 90 days is considered a long-term test. Because they monitor the air for longer periods of time, they give a more accurate estimate for your year-long average radon levels. Alpha Track and Electret are both commonly used for long-term testing. As a general rule, you may simply follow the instructions on your test kit. However, there are some additional steps which can help improve the accuracy of short-term tests. A method using both types of test has been developed by the EPA as an efficient way to catch high radon levels. Because short-term tests cannot accurately predict the year-long fluctuations of radon in your home, a little preparation is advisable. Check the weather. A two to three day test should not be run if you are expecting a severe storm or unusually high winds. Close all outer doors and windows at least 12 hours prior to testing for two to three day tests. Keep them closed as much as possible during any short-term testing. Shut down any ventilation units that move air inside or outside. Exceptions are small exhaust fans that run for only short periods, fan components of a radon-reduction system, and HVAC units which re-circulate air. Choose a location on the lowest floor of your home which receives regular use. Furthermore, the room you place the test in should also be heavily used, although kitchens or bathrooms are poor choices. Pick a spot in the room which is at least 20 inches above the floor and away from drafts, external walls, heat, and humidity to avoid inaccurate readings. This simple method was developed to help detect dangerous radon levels more quickly. It is especially useful if you have reason to believe your home is at high risk (such as a high result in previous tests). Take a short-term test and check the results. If the results are 4 pCi/L or higher, you will need to do a follow-up test. If the results are 8 pCi/L or higher, take a second short-term test immediately. If the results are below 8 pCi/L, you may choose either a short-term or long-term test as a follow-up. The higher the result of the first test, the more you should consider another short-term test. When using two short-term tests, you should average the test results. With a long-term test, only the results of that test are necessary. A final rating of 4 pCi/L or higher indicates you should consider abatement. A result of 2 pCi/L or lower is considered normal, and 1.3 pCi/L is the indoor average (the outdoor average is .8 pCi/L). Remember that the conversion ratio between pCi/L and Bq/m^3 is 1:37. As radon carries risk at any level, the lower your indoor level the better. While it is currently impossible to eliminate radon levels completely, there are several methods to reduce existing radon or even lower the risk in new construction projects. You should always hire a certified professional for radon-related projects, as there is a risk of making the problem worse. Be sure to get a few quotes before choosing, and try to provide as much information as possible about your home’s construction so the contractor can pick the best solution for your home. There are many methods available to reduce your radon levels, some of which are limited to certain types of foundations. It might also be necessary to employ a combination of methods if your home has more than one type of foundation. Older homes and houses which have additions for instance, often have a basement in one part of the foundation and a slab or crawlspace in another part. The most common and effective method to reduce radon in a crawlspace home is known as submembrane suction. 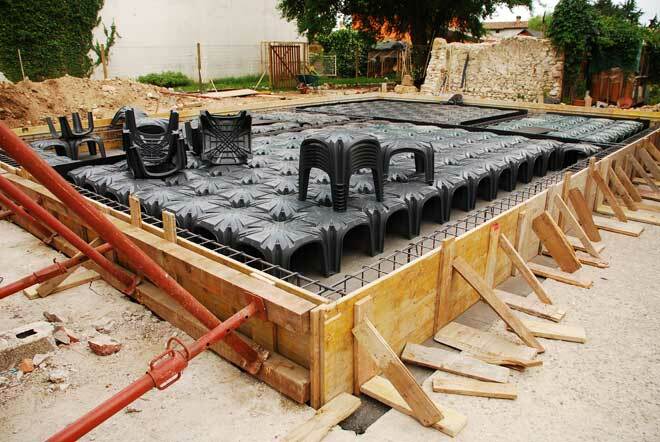 The contractor covers the soil floor with a high-density plastic sheet to seal the area. The radon under the sheet is then vented outdoors using a fan and vent pipe. Active crawlspace depressurization is another, less-effective option. In this method, the crawlspace is sealed from the rest of the home and air is pulled out using a fan. This poses problems with some appliances and may affect the efficiency of your HVAC system, increasing utility bills. The third method is using passive or active ventilation. Passive ventilation simply employs existing or additional vents to allow radon to escape. Meanwhile, active ventilation adds a fan for better air circulation. Appliances, pipes, and other objects in the crawlspace may need to be insulated, especially in colder climates. Note that your energy bills may be affected by the increased ventilation. One of the first things a contractor will do is make a visual inspection to determine the best abatement method for your home. They may also run one or more diagnostic tests to determine soil density when considering a soil suction method. This density is known as soil communication and is usually determined by using chemical smoke and a vacuum cleaner hose inserted through separate holes. By observing the behavior of the smoke, the contractor can determine air movements and how dense the underlying ground is. Active Subslab Suction – Also known as subslab depressurization, this is most common and successful method. The contractor inserts one or more suction pipes through the floor slab into the ground beneath and/or below the slab from outside your home. How many pipes are needed depends upon how easily air is able to pass through the soil or crushed rock, although one pipe is often enough. A radon vent fan is then connected to the pipes to draw out radon, creating a vacuum under the slab. This fan may be located outside or in an unconditioned attic or garage. Block-Wall Suction – Used in basements that employ cinder blocks or other hollow blocks for the foundation walls, block-wall suction depressurizes the walls while removing radon. Beyond the location, this method functions the same as subslab suction and the two are often used in conjunction. Passive Subslab Suction – Less effective than the active variation, the passive method doesn’t include a fan and instead relies upon natural differences in pressure and airflow to function. It’s commonly used in radon resistant construction methods. Sump-Hole Suction – This method takes advantage of existing drain tiles or perforated pipes as found in homes with sump pumps. The sump is capped and becomes the location for the radon suction pipe, pulling radon away from the home in addition to draining water. There are also other variations of drain tile suction that function on the same principle. There are some methods which may be used regardless of the foundation type. On their own, these methods are not always very effective, but prove highly beneficial as part of a combined system. Foundation Sealing – This method is not recommended by the EPA as a standalone remedy, although it can boost the efficiency of other methods and reduce the loss of conditioned air. The cost of sealing your foundation may thus pay for itself over time. Note that your home will naturally continue to settle, so it is impossible to keep your foundation completely free of cracks. Heat Recovery Ventilator (HRV) – Also referred to as an air-to-air heat exchanger, an HRV brings outdoor air into the home while exhausting indoor air. The heat or cold of the exhaust is transferred to the intake to maintain indoor temperature while improving ventilation. 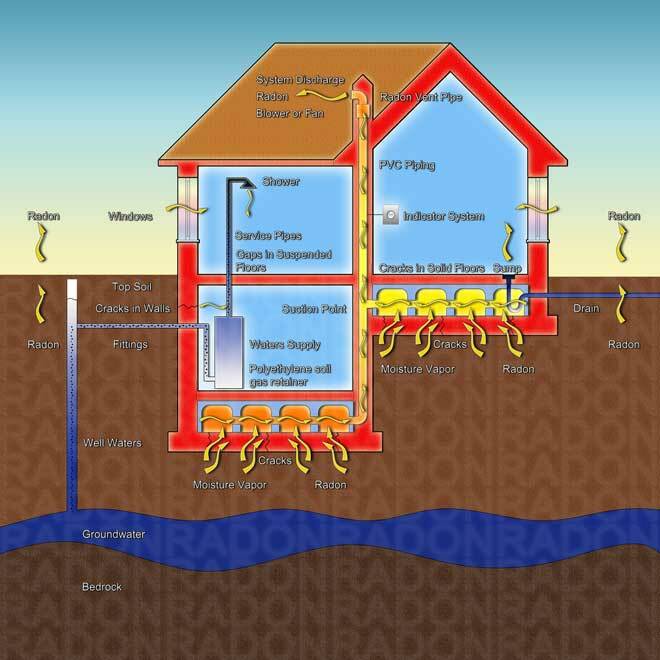 This system not only reduces radon, but can remove other air pollutants as well. It can be used to ventilate part or all of your home, but is most effective against radon when focused on the basement or ground floor (if you have no basement). Note that this system does require power and will thus impact your energy bills. House/Room Pressurization – The effectiveness of this method depends heavily upon climate, lifestyle habits, appliances, and the way your home was built. It can also lead to moisture problems and higher energy bills, so it tends to be a last resort. You will need to keep windows and exterior doors closed as much as possible for this method to work at all. The goal is to use a fan to blow air into the basement or ground floor from outside or upstairs, increasing the local pressure enough to keep radon gas from entering the home. Natural Ventilation – Open windows, vents located in the basement or lower floors and other openings can help temporarily reduce radon levels. These levels return after approximately 12 hours, so this method should be considered strictly as a temporary measure. If you are remodeling, adding an extension, or building a new home; there are several construction techniques that will help keep radon levels low at a lower price than adding mitigation systems down the road. One popular example uses a four inch thick layer of gravel topped by a six mil polyethylene sheet to serve as both a vapor barrier and separator to keep the wet concrete of the foundation from clogging the gravel layer. A vent pipe leading from the foundation up through the roof also makes an effective passive system to which a fan may later be added if the added power of an active system is required. As with many other home risks, the overall costs incurred from radon issues will vary greatly depending upon individual circumstances. Testing yourself is inexpensive, with kits (and lab results) generally running between $15 and $35. Professional testing is more accurate, but also more expensive, averaging between $200 and $300. Radon mitigation also varies. For example, a passive or active suction system will run anywhere from $550 to $2500 on average, with the exact cost being largely dependent upon the size of your home. Meanwhile, a radon mitigation system runs between $750 and $3,000 to install. Annual maintenance costs range from no cost to $700, and fan replacement will cost $250 to $300 every five years. A water radon mitigation system for ground water runs between $1,000 and $4,500 to install, with annual maintenance being $250 or less.